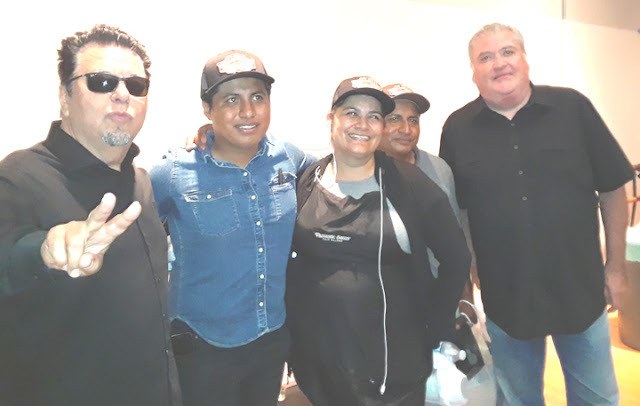 Los Lobos' Cesar Rosas (l.) and David Hidalgo (far right) flank elotero Benjamin Ramírez (2nd from left) and his parents Imelda Reyes and Alex Ramírez backstage at the TATUAJE exhibition hosted by Plaza de la Raza and produced by Antonio Pelayo.. Photo by Abel Salas. There is a curious way in which class prejudice bypasses the parts of the brain that use common sense or flexibility. A perfect example of this phenomenon is the now infamous video of Argentine hipster Carlos Hakas overturning the food cart of Mexican immigrant Benjamin Ramírez. In Hakas’s eyes, Ramírez’s crime was blocking the sidewalk, in addition to not having that most prized symbol of American bureaucracy and Los Angeles etiquette: A permit. Every time I watch the video I keep asking myself, why didn’t Hakas just walk around the thing? On a daily basis, in this cauldron of a city, I simply walk around the food trucks, screaming prophets and possible romantic interests. Why couldn’t Hakas just walk around Ramírez’s cart and continue having (I assume) a normal day? The truth is Hakas revealed some truths about both gentrification and class in L.A., if not the United States as a whole. It is almost a blessing in disguise that Hakas turned out to be Argentinian, because it makes it that much more difficult to frame current struggles as just being racial. Class in America is something kept hidden away in the closet of our national consciousness. Hakas harassed Ramirez the way any feudal lord would have treated a peasant blocking his way in 14th century Europe. It is typical for the apostles of hipsterism, whether in Los Angeles or anywhere, to try and use the law to cloak their disdain for those they see as lower or ruining the vistas. They even do it to themselves. Not too long ago a friend of mine living in Santa Monica had to deal with a pestering landlord who forbid tenants from leaving their cars parked in their apartment’s own drive way. Of course the well to do should be allowed to do whatever they want with themselves in their neighborhoods. The whole Hakas episode however, is a startling reminder of how gentrification threatens a lot of the wider social fabric of a community. Food vendors, in particular Latino ones, are as common to Los Angeles as palm trees. In predominantly Hispanic areas it is simply a part of tradition going back generations. When I am able to rise at 7 a.m., instead of a rooster, I hear with clockwork precision, the pleasant, but loudly insistent lady who sells elote and champurrado. “Eloteee! Champuradddooo!” With the last vowel of each word suspended like a musical note, this is her blaring self-advertisement, a neighborhood staple for eons. I imagine a hipster moving into the neighborhood, first squeezing a pillow against his ears, then deciding to walk outside and violently silence the champurrado lady. No doubt the excuse would be that in a proper neighborhood one just doesn’t walk around shouting what they’re selling. In East L.A. we do. Politically, I skew leftward, and I’m staunchly anti-monarchist. But if I could ever afford a place in Westwood, I would respectfully restrain myself from telling the bookstores in Persian Square to remove their glowing portraits of the Shah. It’s not my business to do so. And who am I to lecture the shop owners on their own history and community? Hakas decided he didn’t like the sight of a street vendor selling elote, it didn’t fit his sense of a proper sidewalk aesthetic. Disconnected from the vending culture Ramirez is a part of, Hakas simply viewed him as some kind of a blemish or undesirable stain akin to blight. This is how gentrification assaults culture—with disdainful apathy at best and open self-righteous hostility at worst. If we are to properly address the issues raised by increasing gentrification, then the issue of class itself has to be discussed. As this incident demonstrates, the social issues affecting such a diverse and densely populated city are very complex. Vendors have a unique way of exposing the fault lines in society. It was police harassment of a vendor in Tunisia that kicked off the Arab Spring, and now the Ramirez vs. Hakas video reveals to us the much deeper divide that economics produces in the U.S. It has also revealed our positive natures as well. Online and in person, donations to Ramirez for the repair of his cart exceeded $4,000. Hopefully the outcome of this episode is a groundswell of awareness that encourages us to be more mindful. Meanwhile, this remains a vibrant city where many hassles (and stained t-shirts) can be avoided if we just walk around, or maybe even consider stopping and grabbing a corn and chili snack.